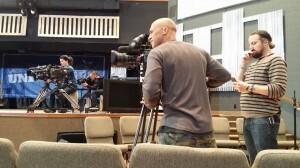 Filming at Grace began in February, and the show aired Thursday, June 12. It Takes a Church poses the question, “What does it take to find love?” and answers it over a 45-minute time slot hosted by Natalie Grant (pictured above on the left). With the premise of a stereotypical dating game, where one young lady chooses from among eight young men vying for her affection, “It Takes a Church” adopts a different matchmaking methodology: all contestants come from the church’s congregation, and the church itself plays a large part in determining who is appropriate for the young lady. “A leap of faith could land a lifetime of love,” the show quips. After praying over the opportunity, Grace Community’s pastoral leadership team decided to accept. “We saw it as [a chance] to have a platform in our world on a major network channel not only to present biblical, godly values, but also to elevate and to give Jesus greater glory,” said Brown. “We saw it as an opportunity to meet with some of the most influential people in the world,” said Brown. “They basically set up in our church from a Sunday morning experience through the whole taping of [the young lady] choosing, going on dates, pastor moments with [the couples], and matchmaking. I was able to rub shoulders with some of the front, lead men and women in our world when it comes to major network TV. My goal was obviously to share Christ with them. Our hope was that we planted the seed of the Gospel there, too. “Overall,” Brown said, “we realize we took some risks. We know there are going to be some critics out there. We know we’re going to be judged. It hasn’t stopped us because we felt that this is what God wanted us to do. We’ll work in the mission field that God planted right here. If He says go, we’ll go. “We are anxiously awaiting the show itself,” Brown continued, “and our hope is that when it is aired, it truly just gives Jesus greater glory. That even the unchurched person or de-churched person would say, ‘The local church is different,’ and that it would have them running back to the local church and finding Jesus. Above all and before all and in all, our hearts’ desire is to use this as a platform to point people to Jesus. That’s ultimately why we did it. 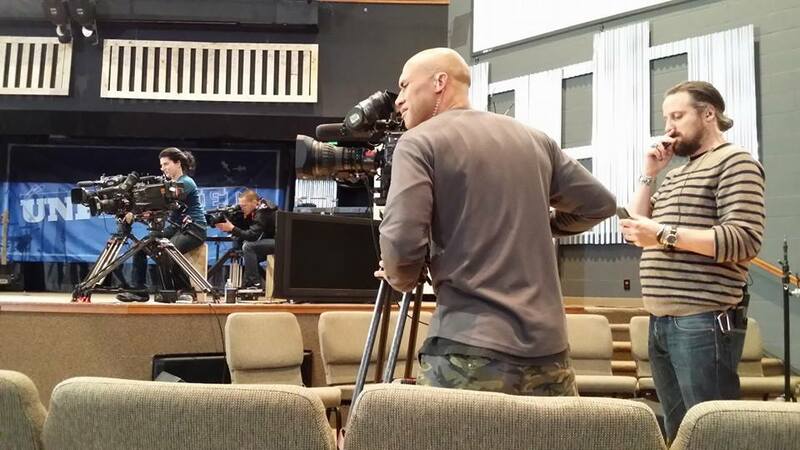 Click here to watch Pastor Jim Brown explain why the church decided to participate in filming It Takes a Church. Below is a trailer for the show, which includes a number of clips from the episode that was filmed in Goshen.